One of the most telling reactions to the state budget proposal released by Governor Pat McCrory Wednesday came from Senate President Pro Tem Phil Berger who was not happy that McCrory’s plan would slightly increase state spending. Berger told the News & Observer that he believes less is better than more. Teachers who have been fired, laid off workers who are losing unemployment benefits and parents of at-risk kids locked out of pre-k programs in the last two years are well aware of Berger’s penchant for less. It’s true that McCrory did not propose the radical tea party slash and burn budget that Berger apparently would have preferred and that many in Raleigh feared he would come up with when he appointed Art Pope as state budget director. That prompted another interesting reaction to his budget plan, a round of cautious and tentative praise from a range of advocates who were bracing for the worst and were understandably relieved that McCrory did not recommend another round of devastating cuts to education and human services. But when you read the details, McCrory’s budget is not a plan to move North Carolina forward. It just seems that way because the budgets of the last two years have been so draconian. Yes, McCrory spends slightly more than last year but as the N.C. Budget & Tax Center points out, he doesn’t spend enough to keep state services at their current and woefully inadequate levels when you consider increased school enrollments and inflationary increases. It’s not a step forward at all, it’s a small step backwards. 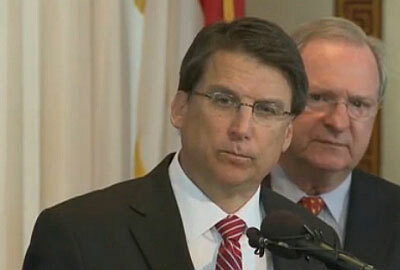 Like almost any budget, there are specific things to like and dislike in McCrory’s plan. He adds 1,800 teachers, an admission that the teacher cuts in the last two years were misguided, but he pays for them by firing 3,000 teaching assistants in the 2nd and 3rd grades. He gives teachers and state employees a one-percent pay raise but ominously puts $7.5 million in a reserve for severance pay for future state employee layoffs. He fully funds the state Medicaid program but this comes after signing a bill denying Medicaid expansion under the Affordable Care Act that would have provided health care for 500,000 low-income adults with the federal government picking up most of the cost. McCrory’s budget documents also include absurd language about the state not being able to sustain the rapid growth in Medicaid spending. Medicaid costs have been growing less in North Carolina than in almost every other state in recent years. McCrory’s proposal does not increase university tuition for in-state students but out-of-state students will pay higher rates and more disturbingly, the UNC system is targeted for $139 million in budget cuts after suffering more than $400 million in reductions in the last two years. And there’s evidence of the Pope/tea party philosophy sprinkled in too. The budget abolishes funding for the N.C. Center for the Advancement of Teaching, long a target of the right-wing think tanks that Pope bankrolls. McCrory also wants to end public financing of judicial elections and slash funding for rural and community economic development efforts. Both programs have also long been on the right-wing hit list. The budget plan would transfer much of the legal staff out of Democratic Attorney General Roy Cooper’s office while restoring staff to Republican Lieutenant Governor Dan Forest. McCrory does deserve credit for proposing $10 million for victims of the state eugenics program, funding that Berger and the Senate refused to support last year. And he includes money to allow 5,000 more at-risk kids to enroll in pre-k, though that still doesn’t restore the cuts that the General Assembly has made to the program in the last two years. In a sane political environment, McCrory’s spending plan would be a floor that lawmakers would build on with increased investments in education, human services, environmental protections and community economic development. But these are not normal political times in North Carolina. The reactions to McCrory’s meager and inadequate budget are ample evidence of that.